BANGKOK (Reuters) - Seizures of high-purity crystal methamphetamine have surged more than tenfold in Thailand over the past two years, statistics show, a stark indicator of the growth in industrial-scale production of the stimulant in neighboring Myanmar. Thailand is a major trafficking route for crystal meth manufactured in Myanmar's Shan and Kachin states, where police say Asian organized crime groups have allied with local pro-government militias and armed rebels to set-up "super labs". Some 18.4 tonnes of crystal meth, also known as ice, was seized in Thailand in 2018, according to preliminary statistics from the country's Office of the Narcotics Control Board (ONCB) reviewed by Reuters. The final data is expected to be released publicly next month. That is up from 5.2 tonnes in 2017 and 1.6 tonnes in 2016. It's more than treble the amount captured across all of Southeast Asia five years ago. Myanmar's illicit labs also pump out tablets of meth mixed with caffeine, commonly know as "yaba", or crazy pill, in the Thai language. The tablets are popular with low-paid workers in gruelling jobs and poor recreational drug users across Southeast Asia. The average price of a meth tablet was 200 baht ($6.33) in 2013. The latest data, for 2017, showed a yaba pill can be bought for as little as 80 baht ($2.50), he said. By flooding Thailand and other countries with meth, organized crime groups have "generated new users" by enticing them with lower prices, Niyom said. The users then become dependent on the highly addictive drug, creating a bigger market for the product. 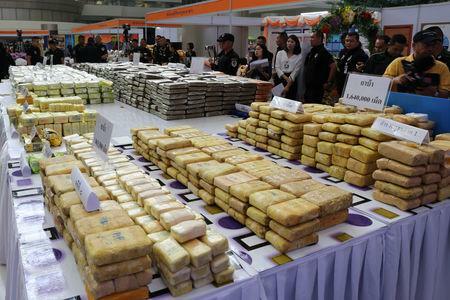 Southeast Asia's Golden Triangle - which encompasses northern Myanmar and parts of Laos and Thailand - has long been a hub of illicit drug trafficking. Regional police and analysts told Reuters that organized crime groups exploit the semi-lawless northern Myanmar borderlands, doing deals with the multitude of ethnic armed gangs and state-sponsored militias who control territory there. According to an ONCB briefing document reviewed by Reuters, 99.92 percent of the crystal meth seized in Thailand in the first six months of 2018 was 90 percent pure or higher.